Trent surprised me with this on Christmas Morning! A mantle and soon to be added gas fireplace. (the bright flamish light is just a wad of Christmas lights for effect. It's not quite done yet but he's working on that. P.S. 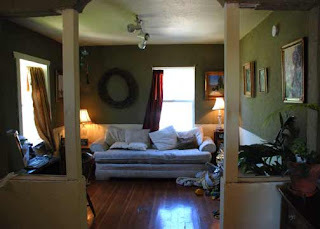 here is what it looked like before the mantle was up. Oh and another thing, the window won't be missed to badly because that is the garage wall and would have been removed anyway once we get our garage built.